If you have your eye on the 2019 Forest River Grey Wolf 26RR then come and see us at Lakeshore RV Center in Muskegon, Michigan for a price you won't believe! We'll save you thousands on this Toy Hauler because we're #1 in RV sales and service, and we sell every brand we carry at wholesale prices in Michigan and beyond! We're conveniently located at 4500 E Apple Ave Muskegon Michigan 49442! And with our fast, reliable delivery worldwide, you can call us at 231-788-2040 and have this great Travel Trailer Toy Hauler at your door in no time! This terrific Travel Trailer Toy Hauler handles great on the road! It's 30' 8" long, 8' 0" wide, and 10' 6" high, with a hitch weight of 775 lbs. When you reach your destination, you'll set up easily and the 15' 0" awning opens easily for shade and comfort. With a sturdy GVWR of 7775 lbs, you'll enjoy years of camping fun! This 30' 8" long, 8' 0" wide, and 10' 6" high Travel Trailer Toy Hauler provides plenty of legroom to stretch out after a long trip! The slides provide even more walking room inside! This Grey Wolf is kept temperature controlled with the 20000 BTU furnace and 13500 BTU a/c. You'll sleep like royalty in the handsome bedroom found in the Forest River Grey Wolf 26RR! It's handsomely furnished and has a regal Queen bed! You'll cozy in at the end of the day and ease off to dreamland before you know it! Up to 4 people can sleep safe and sound in this RV! This Travel Trailer Toy Hauler has all the bathroom conveniences, thanks to its 38 gallon gray water tank and 38 gallon black water tank. Never worry about having enough hot water with 40 lbs. of LP tank capacity. Plenty to save you from making trips to the campground's communal bathroom! 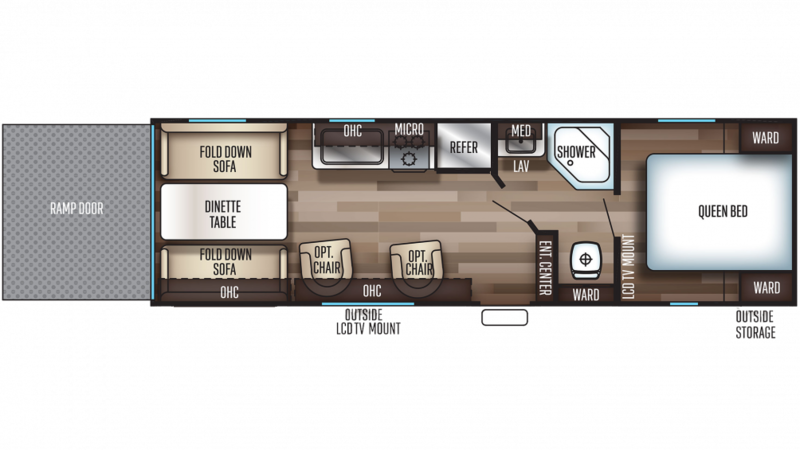 The RV bathroom also has a sink vanity, shower, and a Foot Flush toilet!This Toy Hauler is made for outdoor fun, especially with its big, 16' 3" long garage that can hold all your camping gear. Like to ride your motorbike or ATV? This toy hauler can carry it easily with its cargo capacity of 2745 lbs!